Sterling Harper Fly, Jr., M.D. 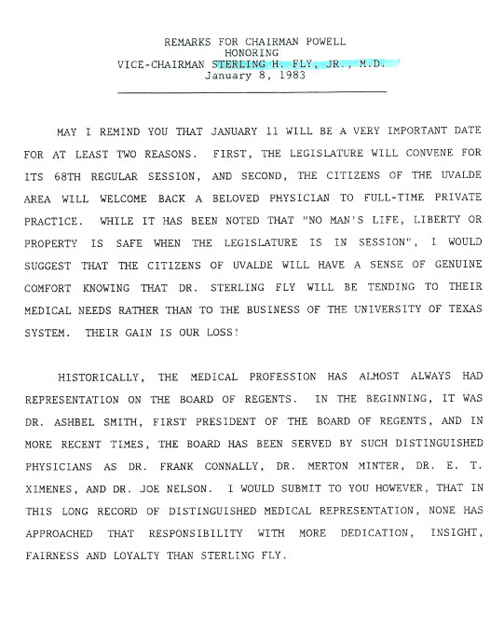 STERLING HARPER FLY, JR., M.D., of Uvalde, was appointed to the Board of Regents of The University of Texas System by Governor Dolph Briscoe in January, 1977, to serve a six-year term. Dr. Fly was elected vice chairman of the U. T. System Board of Regents on January 24, 1981. He was educated at Crystal City High School, Texas A&M University, The University of Texas at Austin and The University of Texas Galveston Medical Branch. He served an internship at the Philadelphia General Hospital and a residency (general practice) at the Robert B. Green Hospital in San Antonio. Dr. Fly has been in the private practice of medicine in Uvalde since 1952, and also has been clinical professor of family practice at the U. T. Medical School - San Antonio. He served as a first lieutenant in the U.S.A.R. Medical Corps and as a volunteer physician in Vietnam. He is a member of the Nine Counties Medical Society, Texas and American Medical Associations; a fellow of the American Academy of Family Practice; Diplomate of the American Board of Family Practice; and a member of the Alpha Omega Alpha honor medical society. Dr. Fly has a long-standing interest in education. His father was superintendent of schools in Sabinal and Crystal City, and served as president of Southwest Texas Junior College. Active in civic organizations, Dr. Fly is affiliated with the Rotary Club and Boy Scouts of America. He is a former member of the board of trustees of Southwest Texas Junior College, former chairman of the board of managers of the Uvalde County Hospital Authority and former member of the State Board of Health Resources. His hobbies are hunting, fishing and archaeology. Dr. Fly is married to the former Bobbie Kirkpatrick of Portland, Texas, and the are the parents of four children -- Marguerite; Sterling H., III; Suzanne, and Bruce.